1. Cut the beef into thin slices and marinate them with light soy sauce, dark soy sauce, vinegar, green chili paste, ginger paste , crushed black pepper and tasting salt for at least 7/8 hours for best result..If u don’t have that time at least for 1 hour..
2. Put oil in the wok and when hot, add the beef…Cook it for at least 10/15 min or until the water drying out… Add little water, just enough to make the meat tender. 5. Dry out the gravy. 1. Sauces contains enough salt in them. So I did not use any extra salt . But you can alwayz adjust the salt adding at the end of the cooking. 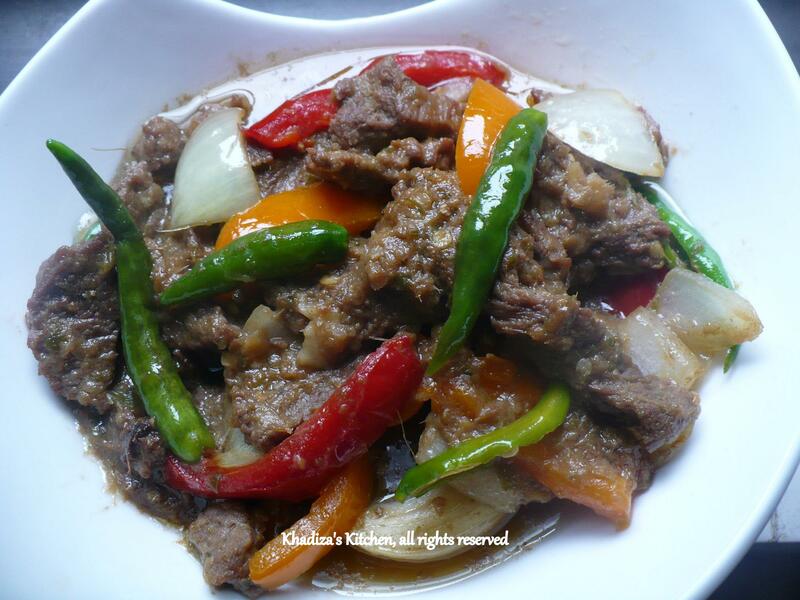 This entry was posted in Beef, Glossary / Notes, Meat and tagged Beef capsicum, Beef recipe, Desi style Chinese recipe, Indo-Chinese recipe. Bookmark the permalink. Apu can u manage to upload the recipe of Mezbani Beef?